Ulrich Ostergaard top-scored for Panthers. Peterborough Panthers swept to the top of the Premier League Cup Southern Group in style last night (April 10). The city team registered their biggest away success since 2003 when pulverising Plymouth Devils 57-36 in Devon. It was a result which continued their stunning transformation after losing two riders to serious injuries and tasting defeat in their first three competitive meetings of the new season. But that torrid start to a new chapter for the club is now becoming a distant memory helped by another eye-catching display hot on the heels of an Easter Monday derby double against Rye House and Ipswich. Thirteen race-winners and 10 heat advantages were statistics which emphasised Panthers’ dominance at the tiny St Boniface Arena track as captain Ulrich Ostergaard led the onslaught. 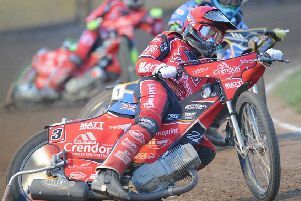 The Dane produced a 13-point haul which featured four victories, dropping his only points on the night when third behind Morten Risager in a heat 13 battle won by Lasse Bjerre. That was one of three triumphs for the Panthers guest number one in a double-figures display of his own. Teenager Robert Lambert was another man to impress as he was only denied a first maximum at Premier League level by a last place in heat 15. Team boss Carl Johnson said: “It was a complete team performance to continue a fine run of form. “To provide 13 of the race winners at an away track is no mean feat and 10 heat advantages was another great effort. “It highlights how dominant we were. People will say Plymouth had a bad night, but we made them have it. Lewis Blackbird also won two races for Panthers to continue his solid form in the middle order while there was a major positive at reserve as Ollie Greenwood delivered his best display of the season by far. Bottom-end partner Simon Lambert also chipped in with victory as they combined for a 5-1 in the reserves’ race for the third successive meeting. Short-term recruit Michael Palm Toft was the only Panthers rider not be at least paid for a heat win, but he still banked a useful half-a-dozen points on his return to a track he called home for part of the 2013 season. Panthers roared into a 14-point advantage after just seven races before their progress was briefly held up. Jack Holder, the youngest brother of former world champion Chris, successfully completed a double-points mission in heat eight to earn Plymouth a 7-2 – their only advantage of the entire night. It cut Panthers’ cushion to nine points and a shared race then followed before the visitors upped the ante with a run of five successive advantages. They had all four league points in the bag with three races to spare as they moved clear of Rye House and Somerset by virtue of a superior points difference. Panthers are back in action tomorrow (April 12) when they entertain Plymouth at the East of England Showground (3pm start). PLYMOUTH: Jack Holder 14, Morten Risager 8+1, Sam Simota 8, Ashley Morris 3+2, Ryan Fisher 2, Sam Chapman 1, Rider replacement for Kyle Newman. PANTHERS: Ulrich Ostergaard 13, Robert Lambert 11+1, Lasse Bjerre 10+1, Lewis Blackbird 8, Oliver Greenwood 6+1, Michael Palm Toft 6, Simon Lambert 3+1.